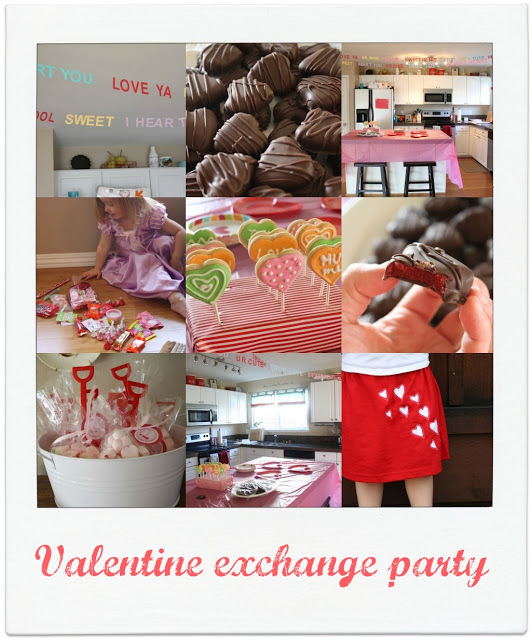 I hosted a Valentine’s Day play date and exchange today for Sadie and Charlotte’s little friends (and mommies)-and it was so much fun! I didn’t do too much decorating, but I did do these Conversation heart word garlands-which I LOVE. I cut them out of card stock on my Silhouette and taped them to some thread. Hung them up by winding the thread around some tacks. 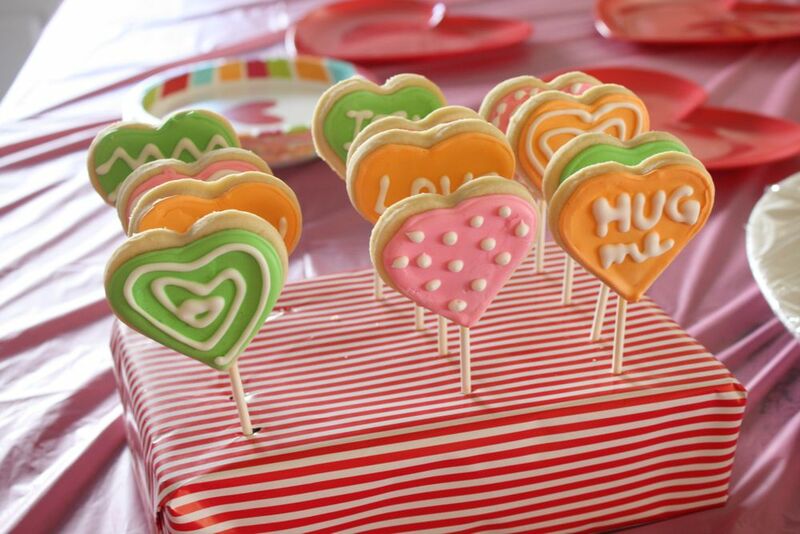 I made some sugar cookie lollipops-which were a big hit with the kids! They loved them-and they actually stayed on the stick til the end-I was surprised at that. I got the idea here, and used my favorite sugar cookie and icing recipe. I also used the gals over on kojo designs’ tip for displaying things on sticks-wrap up some styrofoam. perfect! 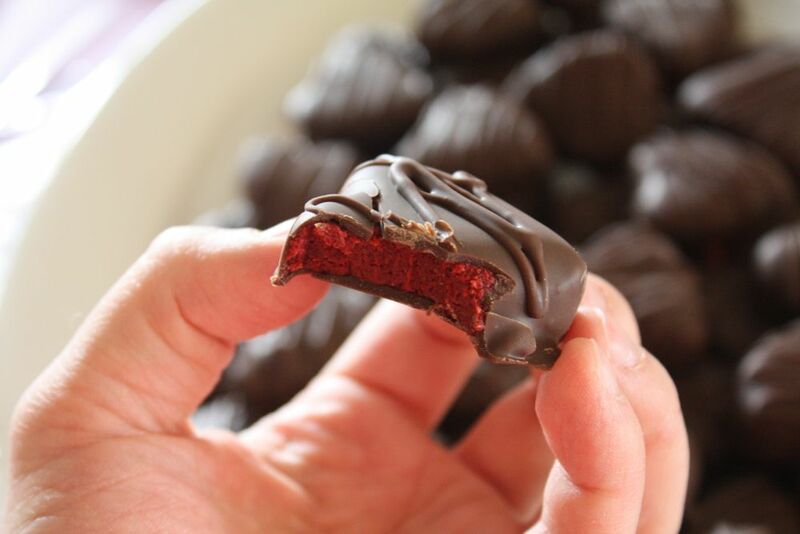 For the mommas, I had to make some red velvet cake balls-in heart form! I shaped them using a silicone heart ice tray I got at target. They were pretty easy to make into hearts-and so cute! and yummy. I also made stuffed pizza rolls for lunch-but didn’t get a pic of those. They were tasty though! A hit with the kiddos too. Of course, here are our valentines-you’ve seen those though. It was fun seeing all the kiddos delivering their cute valentines to each other-they were all hopped up on sugar and so excited! Sadie is so her mommas child-she spent a few minutes organizing her goodies, and even had her kisses organized by color. lol! 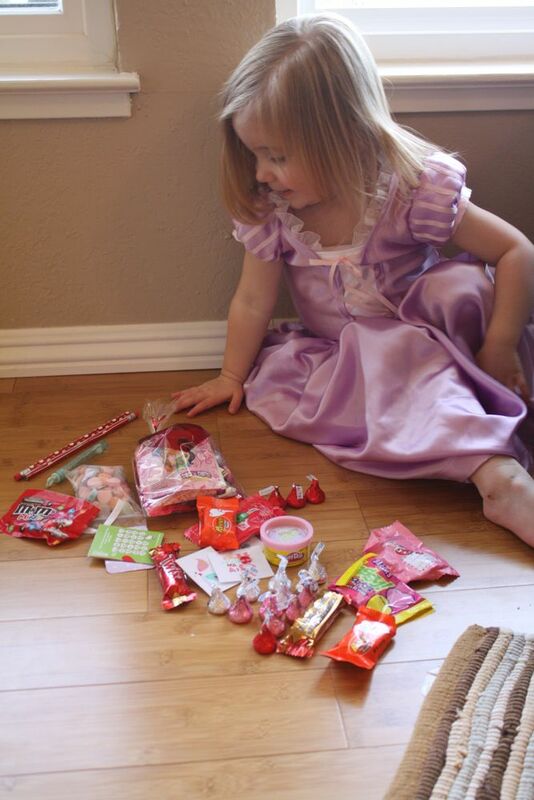 She did start the play date in her Valentine’s Day outfit, but ended it in her Rapunzel dress. hehe. Later in the day she had on two shirts, a tutu, skirt, one rain boot, and one dress up shoe. I LOVE when kids dress themselves! I love that garland! What a great idea! It was the first thing I noticed in the first picture! I was trying to figure out where you would have bought that kind of garland too! LOL I should have known you made it! 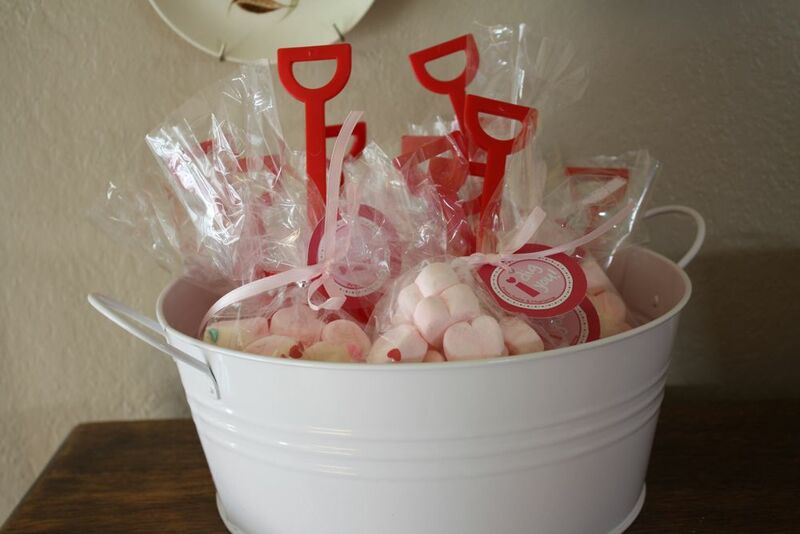 All of your treats for the party look like so much fun and I am sure the kids and mommies all loved it! As for Sadie organizing her candies..my girls do the same thing. It always cracks me up! A Maze ing. What a fun time. Sadie is adorable. I think I’ve said that before. This is so adorable! I love every single detail but the garland is AMAZING! I love the garland, your kitchen, your play date, and Sadie’s dress! This looks like so much fun! 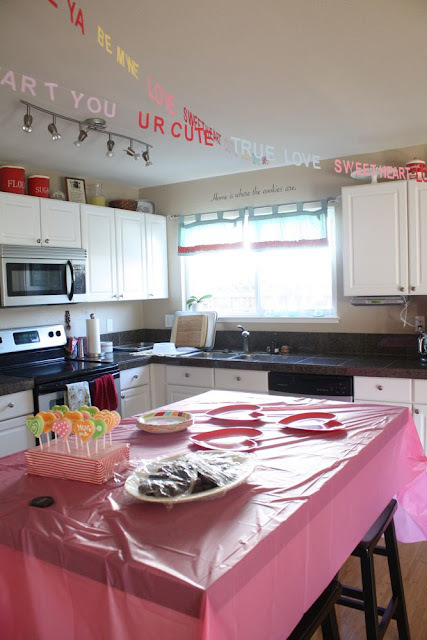 I love your “Dig you…” Valentines and I love the red velvet cake hearts! What a great idea to use ice cube trays. I bet your friends felt so spoiled! okay you are pretty much amazing. i love every detail. i wish we were neighbors. What fun decorations! 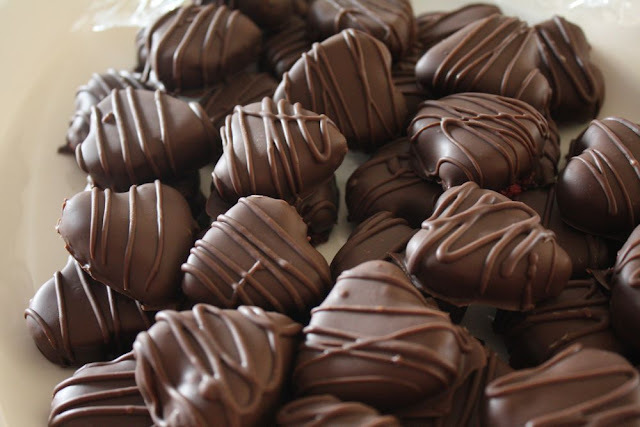 I love the heart shaped cake balls, they look delicious! Cute party! I have that rug, too. And did I miss a tutorial for a Rapunzel dress? That has to be one of your beautiful designs that Sadie is wearing, no?!? I thought that first photo was photoshopped! 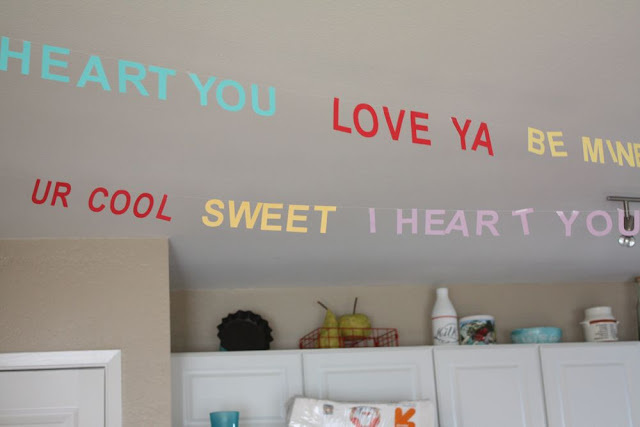 That is the coolest garland every! I am so using this idea. I LOVE it!! Love the garland!! I am going to have to steal the idea! How fun!! 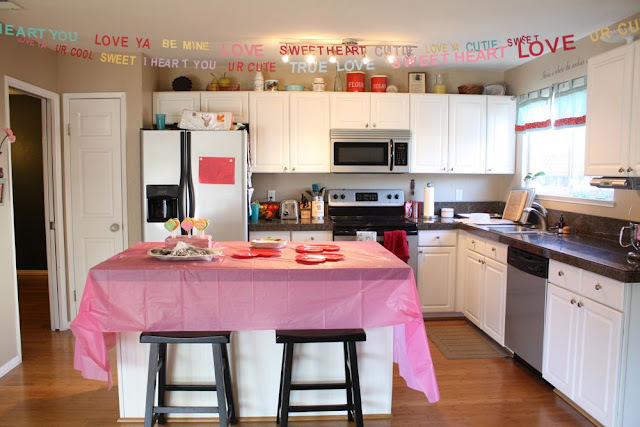 I love the word banners and those heart red velvet cake candies looks so yummmy. Mmm! Super cute Jess. I love the idea of the whole party in and of itself. So fun! And, of course, I am totally in love with that garland. Super cute. And now I want those pizza things you were talking about. Too cute! I have seen garlands like that in a few places and love them. Only problem is I don’t have a silhouette so would have to cut them all out by hand. But for how good they look it would totally be worth it. Oh so cute! You put me to shame. I’m in LOVE with this whole post. I love Everything about it. I want to do things like this for my family, but my kids are still little and would not appreciate it yet. I will file this away for future use when they WILL appreciate it. Love the banner! You could do that with any message. Thanks for sharing … I’ll be linking. And please come join my link party anytime! i have those same silicone ice molds, i also used them for chocolates! they work great.